Last week I got the opportunity to meet lovely local cake maker, Rachel from Sweet Bliss Bakes. Thanks for answering my questions, Rachel. Can you please explain what your company does? Of course, Emma. 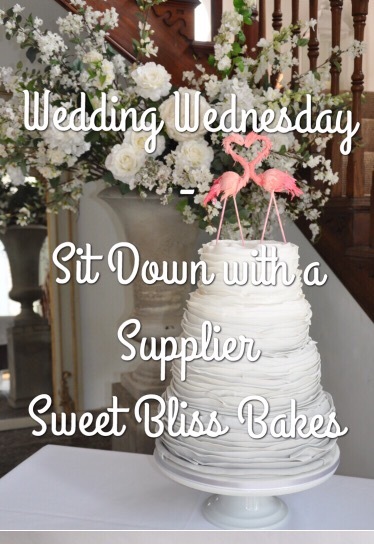 Sweet Bliss Bakes is a home-based wedding cake company in South Somerset. I deliver to wedding venues across South Somerset, all of Dorset and surrounding areas. I create bespoke wedding cakes using the finest quality ingredients as I believe that a cake should taste scrumptious, as well as look beautiful. I source the finest flour and farmhouse butter, free range eggs, local and Fair Trade where possible and always use organic fruits, herbs and flowers to make my own preserves and flavourings. I can also provide cakes for special diets. I use a range of techniques to decorate cakes including royal icing and piping, brush embroidery, applique lace, hand painting, and making sugar flowers, models and toppers. I am registered with South Somerset District Council and hold a Food Standards Agency Level 5 hygiene rating, am insured and hold a Level 2 Award in Food Safety in Catering. Working from home gives me lots of flexibility as wedding cakes are a complicated business! The work varies so much from baking all day one day to spending hours making delicate sugar flowers to meeting clients and working on new designs, not to mention answering emails and updating social media. First and foremost, it’s your day so enjoy it. Don’t try to please anyone other than yourselves; your day will create those lasting memories and photographs whereas your auntie will quickly forget that you didn’t go with her cake flavour choices! You may have lots of ideas for how you’d like your wedding cake to look but make sure your cake will taste as great as it looks. 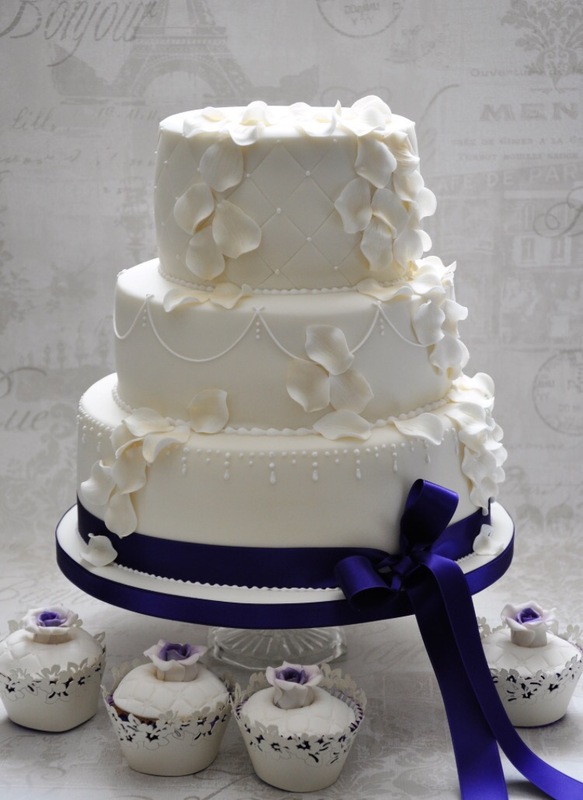 Most cake decorators will offer you a consultation with cake tasting although some may charge a small fee. 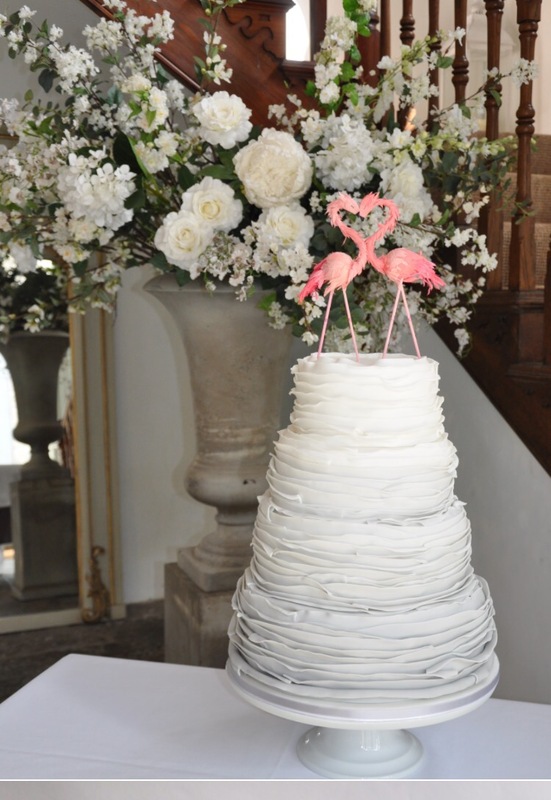 If you are having a tiered cake you could have different flavours for each tier so you can choose all your favourites. It’s a good idea to think about the wedding menu and you may want to choose complementary flavours particularly if you’re serving your cake as dessert. If you’re serving your cake in the evening after lots of other food you will not need as much cake. If you choose sponge cake it will need to be eaten immediately once it’s cut. A fruit cake will last much longer, so consider when you will be cutting the cake and when your guests will be eating it. A good wedding cake supplier will guide you through all these choices as well as working with you to get your design right. When choosing your cake maker, it’s important that you feel that they understand what you want. Look at their photos and reviews as-well as meeting them to get a feel for how they will work with you. I love that I’m part of a couple’s special day. It’s such a happy time and they are so full of joy planning all the details. I love that I can put everything into creating something that people will enjoy. I love setting up the wedding cake at the venue and seeing it for the first time with all the wedding décor in place; it’s often a ‘wow’ moment as everything comes together! I love receiving a message thanking me, it’s not that I need to be thanked but it makes me so happy to know that all my hard work made somebody happy. 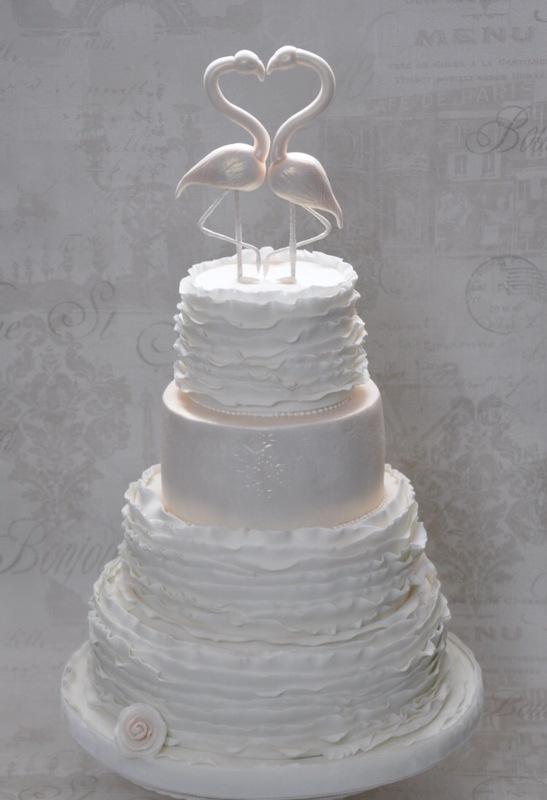 Wedding Cake designs vary so much now as there seems to be no end to the choice available. These are the main trends in wedding cakes for 2017 I’m seeing amongst my clients. 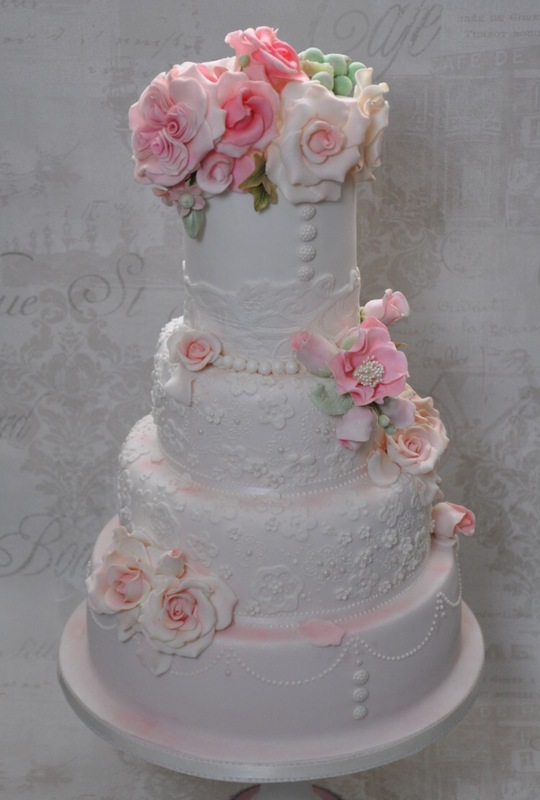 * Texture – buttercream cakes with a rustic texture; or fondant covered with ruffles and frills. * Flowers – fresh or hand-made sugar flowers – trails, garlands or sprays; particularly added to a ‘simple’ plain, textured or ‘naked’ cake. * Metallics and shimmers – often added to just one tier for effect. Rose gold is a new colour proving popular as it has a soft but warm glow and is more subtle than a bright gold. 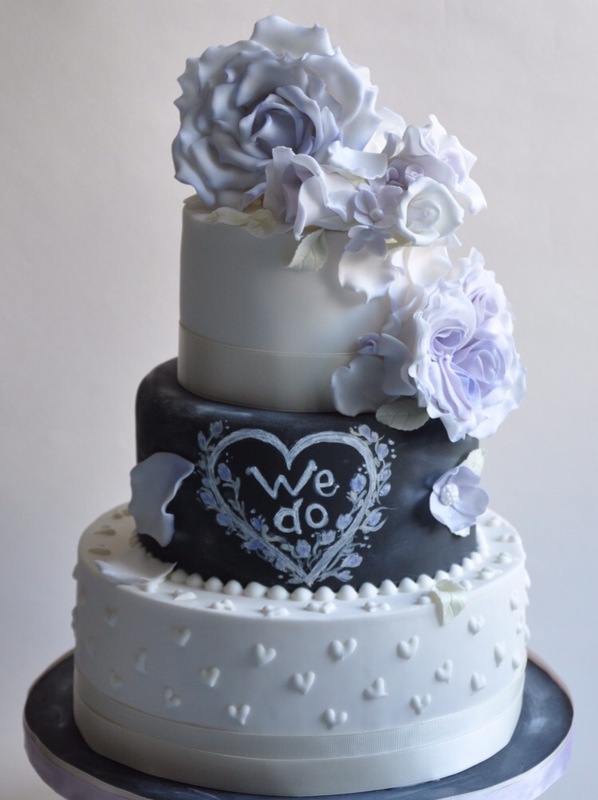 * Personalised – silhouettes telling a couple’s personal story, personalised bride and groom toppers – either in their wedding outfits or reflecting their jobs or interests, ‘reveal’ cakes or ‘half and half’ cakes – with one side decorated to reflect the bride and one side to reflect the groom e.g. half white with elegant piping and flowers to reveal the other side a Batman theme! If you don’t want to worry too much about your day, I’d advise booking a lovely house with wedding team on hand. I love Kingston Maurward in Dorchester. I’ve been very lucky to deliver to all types of venues but my favourites are venues with character, particularly barns or old country houses. They just look stunning decorated to suit most themes and colours. This is so interesting! I love that grey ombre cake with ruffles. I would love to be able to do this one day. I love that these days there is so much choice when it comes to having a cake. Different flavours, types and styles! Find out more about Sweet Bliss Bakes through this interview by Emma at Even Angels Fall. Her blog is lovely and packed full of inspiration and information. I missed out on having a proper cake maker for our wedding as my sister made ours but these look delicious. Especially love the chalkboard style heart cake… although this post is just making me hungry!! Those cakes look fabulous. Just like Devin Mama, my sister made the cake for our wedding.